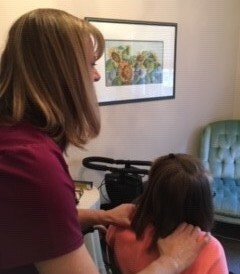 For me, volunteering for Pilgrims Hospice Society as a massage therapist is all about the people. Offering a bit of comfort and a listening ear to those who are going through incredibly tough challenges. Massage can play an important part in end-of-life care, providing comfort and help with pain management, circulation and swelling. I see massage as a way to show compassionate, quality of life care, through the emotional and physical healing power of touch. Everyone deserves to be treated with dignity and respect, especially in their final years, and Pilgrims offers just that. I’m so thankful to be at an age and stage in life where I’m able to volunteer and serve people in this way. It’s a joy to help and I look forward to each day I come. What I love most is getting to truly know the clients and hearing stories of their life. I am always blessed by their courage and beauty.